Since I installed a wooden prehung door for this project, I wrote the first article on exterior door installation called “How To Stain And Finish A Wood Door”. That article title pretty much describes what it’s about. The second article covers “Preparing The Doorway For A New Door” which describes threshold preparation and what to look for once your old door is removed. So let’s assume that you have a wood door and you’ve put a nice finish on it and you’re ready to install it. 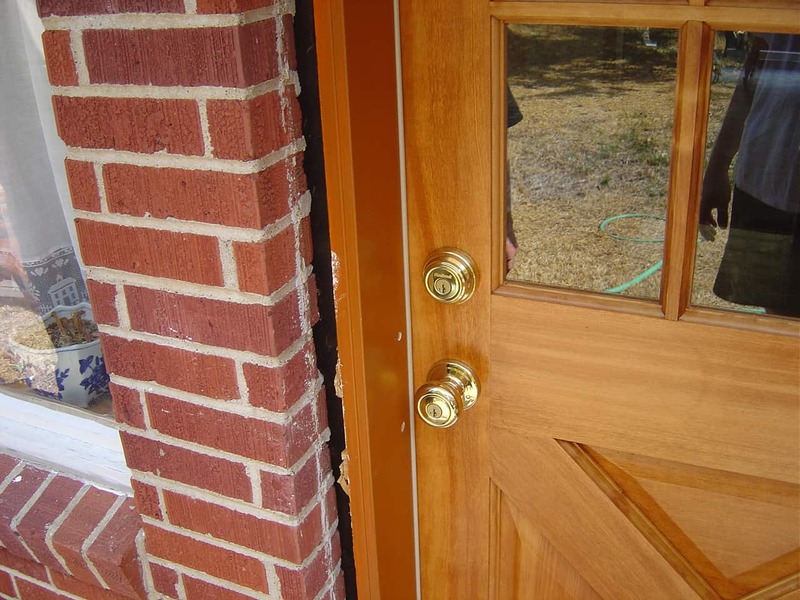 You need to make sure your finished door is put back together with the door jamb, the same way you got it when it arrived. So you have a completed prehung door and its all back together with the hinges on and everything is lined up and in place. It’s important to have everything together again for the new installation. If the prehung door and jamb are back together as a single unit, your finished entry way will be square and it’s the best way to ensure that your new door will open and close properly. If you install the jamb without the door attached, it’s just way more difficult to be sure of a tight and square finished product. With everything together, you can lift the complete unit into the doorway and set it into position. On my project, I painted the jamb while I worked on putting the finish on the wood door. Even though I had to do a lot of touching up after the installation, it was a lot easier to accomplish a nice final job than to try and paint the entire jamb after installation. 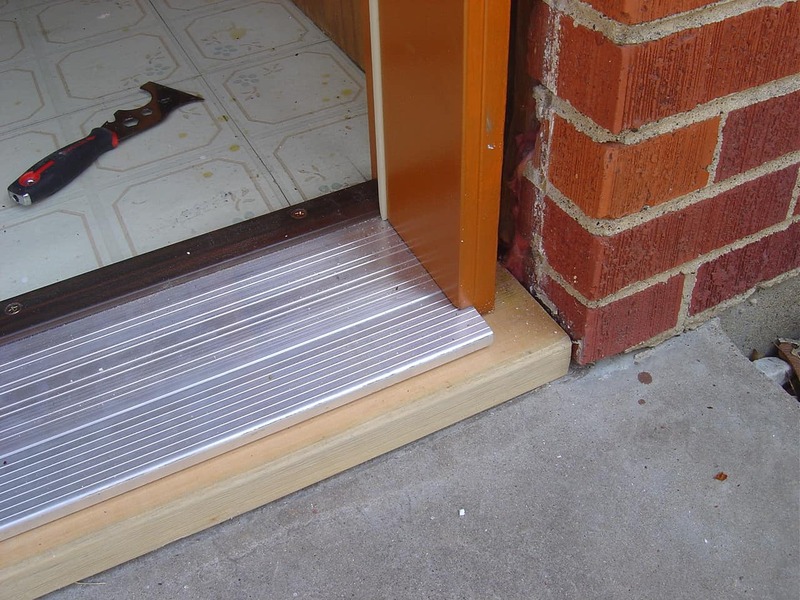 In preparing the rough opening, you need to secure a threshold “base” for your new door. I used a 2″ x 10″ and cut it carefully to fit into the opening. This piece needs to be very level. Use your level to see how well it will work by itself. On mine, I used door shims on the right hand side of this threshold and glued it into place using liquid nails. I used LOTS of liquid nails! Perhaps half of a caulking gun sized tube. Liquid nails will dry hard eventually and create a nice base for the threshold. Place the prehung door centered within the opening and check it everywhere for plumb. Once you are happy with the placement, you can begin to slide shims in between the jamb and the studs. The best places to shim are above and below the knob and dead bolt, about a foot off the ground and about a foot from the top of the jamb. On the other side of the door, shim just above and below the hinges – this will give it the most strength. You can use a nail gun and 2-1/2″ trim nails to hold it in place, but you’ll need to use some 3″ screws through the jamb and into the surrounding studs. Shims can be broken off or cut off where they stick out. I insulated the gap between the prehung door and the studs somewhat loosely but made sure there were no voids anywhere before I put up the trim. At the bottom of the threshold where the 2X10 met the concrete, I “caulked” the gap with liquid nails. (Yes, it will last for years and years!). On my prehung door, trim was used to cover the “work” between the jamb and the walls. Brick molding covered the outside gaps. You can see in the pictures where I drilled tap holes for my screws. After everything is screwed in and solid, you’ll need to fill the holes and touch up paint after everything dries. Then, I caulked everything nice and neat and installed the striker plate, knob and dead bolt after removing the packing pieces that came attached to my prehung door when it arrived..
You may need to adjust the threshold and the sweep if your prehung door has minor adjustments that need to be made, but my door did not. Everything fit really well. Tips: You can use a piece of paper to test the space between the sweep and the threshold. Close the door with a piece of paper under it. Pull out the paper. If there is no friction, the sweep is too high. If the paper tears, the sweep is too low. Take your time and do a good job. A prehung entry door is a strong investment in your home. Do it right. Hire someone who really knows how to hang a prehung door the right way if you don’t feel very confident you can do it. It’ll take you about 2-3 hours to do a good job, so plan accordingly on a nice day. This was a great project. The door ran under $350.00 and after finishing it myself, looks and feels very high end. Finding the right paint match for the trim helps a lot too.